Nouns. Verbs. Adjectives. Pronouns. Only grammar geeks need to care about them, right? Wrong. If you want your business writing to zing, you need to know about these different "parts of speech" (as we say in the trade). Why? Because certain parts of speech are much more common in clunky corpspeak than others. So knowing how to slant your writing away from certain types of words can make a big difference to what your reader thinks of your writing style. 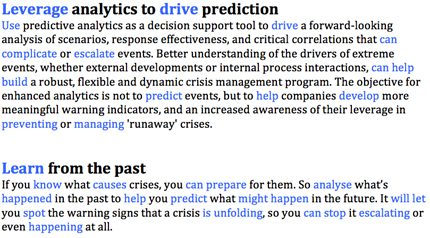 Let's take a look at the same two pieces of writing we put through Word's readability tool last week. The first extract comes from a well-known management consultancy. The second is the same text translated into something more readable. As we'll see, there are big differences in each writer's use of the four different parts of speech mentioned above: nouns, verbs, adjectives and one particular pronoun. Examining these differences offers valuable lessons about why one of these writers is much more readable than the other. These are the “person, place or thing” words. 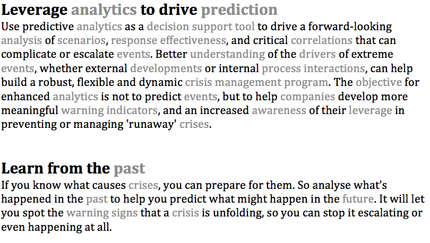 Examples from our texts include analytics, correlations, awareness and crises. Nouns are to writing what your bones are to your body: they provide essential structure, but use too many and your prose will lack dynamism. It will be dry and clunky. Ossified, if you like (from the Latin os, meaning bone). There’s a reason we chose grey to illustrate all the nouns in these pieces. The figures suggest the original is 21.5% greyer than our rewrite. Don’t cluster your nouns Avoid using groups of nouns together as they can make your writing hard to read. Ploughing through concatenations of nouns like decision support tool or crisis management program feels like the literary equivalent of clambering over rocks. At the very least, rather than saying crisis management program, why not say a program for managing crises? Breaking up the cluster of nouns with a simple for gives your audience room to breathe. Learn to spot abstract nouns Abstract nouns are nouns denoting intangible things, such as ideas and feelings. They’re absolutely rife in corpspeak and are one reason why business writing is often so awful. For some hints on how to identify them, see Ditch your communications strategy and just talk. Be specific Using too many abstract nouns is often a sign of a writer mired in the pseudo-academic language of corporate strategising. Root your writing in specifics and your reader will find it much easier to picture what you're talking about. For example, what exactly is a decision support tool? Is it a computer programme? A mind-map? A coin to be tossed? Similarly, what do response effectiveness and process interactions actually look like? If you can’t answer these questions, it's entirely possible you don’t understand what you’re talking about (so imagine how your poor reader feels). Verbs are the “doing” or “action” words. Examples from our texts include use, build and predict. Because verbs are “action” words, they give your writing dynamism, a sense of movement. So if nouns are the bones of your prose, the verbs are its muscle: they power your writing forward. The figures show our rewrite has 72% more muscle than the original - a figure we wish we could achieve in the gym! Use verbs instead of nouns If you’ve begun to hunt down and eliminate your nouns, you’re already on the way to more muscular prose, because you’ll have had little choice but to replace many of them with verbs. For example, a phrase such as understanding of xyz will have become If you understand xyz. Use real verbs Learn to spot dead verbs favoured by bad business writers, such as drive, deliver, focus on and commit to. They’re clichés that give an artificial gloss of dynamism, but actually weigh your writing down. Compare the wordy drive an analysis with the simpler, punchier analyse. Don’t turn nouns into verbs Those of us with delicate writerly ears will wince if you try to turn nouns into verbs. So ditch jargony non-words like actioned, tasked and (ugh) impacted. In our piece above, leverage breaks this rule. It’s a noun that can be used as a verb, but only in the specialist financial sense of to borrow money to increase the return on an investment. Its pairing with a word like analytics confuses rather than clarifies. Adjectives are “describing” words. They modify nouns by giving extra information about the noun in question. That might mean specifying quantity (more houses), size (big houses), colour (red face) or quality (funny face). If nouns are the bones and verbs the muscle, then adjectives are the fat: a sprinkling can add a healthy roundness to your writing, but overdo them and your prose starts to look flabby. Examples from our texts include critical, better and extreme. Oh, dear. If adjectives are the fat, one of these authors needs to go on a serious diet! There’s a reason we chose that colour to highlight the adjectives - ever heard of “purple prose”? Cut out nouns The author of the original used many more nouns than us, so it’s hardly surprising he or she also used more adjectives - as adjectives describe nouns. Avoid tautology Don’t say the same thing twice in different words. In our original text, the adjectives predictive and forward-looking mean the same thing, don’t they? 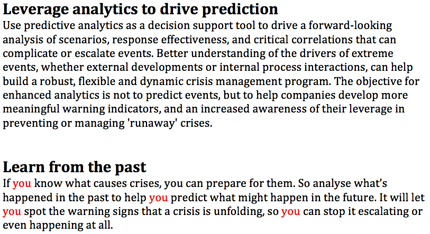 In fact, look closely at that first clause: Use predictive analytics ... to drive a forward-looking analysis. It seems to be saying predict stuff so you can predict stuff. All very circular! Tautological pairs of adjectives are rife in business writing - think of new and innovative, bespoke and customised and a worldwide, global business. Ban such pairings from your workplace. Develop an ear for corporate cliché Take, for example, that adjective meaningful, used to describe warning indicators in the first text above. Is there any less meaningful word than this? Yet you find it peppered throughout corporate prose. (If you can tell us what a meaningless warning might be, do say in the comments). Ditto that euphemistic cliché that is enhanced. What a business really means by this adjective is improved or better but that might imply that there was something wrong with what they had before and that would be an admission of weakness, wouldn’t it? Take a tip from us: your audience probably isn’t as gullible as you think. Tone it down You really don’t need to throw every positive adjective you know at a noun. Take, for example, robust, flexible and dynamic crisis management. Were all three adjectives really necessary? Are we not intelligent enough to understand that perhaps robustness requires flexibility? Or that flexibility requires some dynamism? See here for another embarrassing example of adjectivitis. Learn to spot hyperbolic adjectives and pin above your desk a list of those most overused by marketers - such as ultimate, exciting, iconic and innovative. Delete or be specific The author of the original text contrasted external and internal sources of calamity. But do we really need it spelling out that crises can come from both outside and inside the organisation? And anyway, if you're going to mention this idea, wouldn’t it have been better to give us some examples of both sorts? You is the second-person pronoun, a fondness for which is one of the defining characteristics of a copywriter. There’s a reason you is so beloved by copywriters: it’s an incredibly powerful word. Use it and you’re addressing your reader directly. You’re signalling that your words are relevant to them, rather than being about hypotheticals. Yet again, it’s about being specific, not abstract. If finding the right balance of nouns, verbs and adjectives gives your writing a gym-fit body, then using you gives it a sparkling personality. The word you provides the charisma that makes your reader feel like you care about what concerns them. Use verbs not nouns Notice how all those uses of you are paired with a verb (you know, you predict, you spot, you can)? So if you’ve followed our advice so far and increased your verb count, your copy is probably already on the way to being more reader-focused. Count your uses of you/your (and I/me/us/we) In any piece of business writing, the words you and yours should occur more often than I, me, us or we. Think about it: who would you rather sit next to at a dinner party? The person who talks about nothing but how great they are? Or the person who asks you about you and your life? Business writing is the same. So next time you write a piece you're not entirely happy with, why not run it through the Doris and Bertie readability test. Highlight all the uses of each of the four parts of speech we've discussed above - and see if you can tweak the figures to make your writing kinder to your reader.